Well, I did not dress up for Hallowe’en this year. The intent was dress up as Trapper John from Robert Altman’s M*A*S*H, complete with Hawaiian shirt and golf umbrella, but I had the devil’s own time finding a red and white tropical shirt in later October. Not entirely sure why — it strikes me as just the time of year that one might need a primary-coloured equatorial pick-me-up in one’s wardrobe, but apparently both department stores and secondhand shops disagreed with me. This isn’t the first time I haven’t dressed up on Hallowe’en, but it’s the first time in a long time. And this is the result of a rather slippery slope… a few years ago, I decided that it wasn’t worth it to pay upwards of a hundred dollars on pieces and components to make a Hallowe’en costume just perfect, and since then I’ve even stopped planning my costumes months in advance. So this costumeless year is the clear result of eroding standards, and for that I apologize. By means of recompense, I offer you the following pictures of people dressed up as Batman. 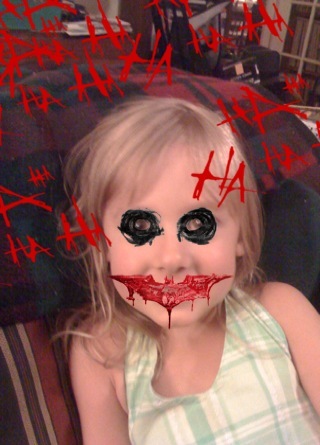 The first is my niece, Gabriele, Jokerized through the Dark Knight: Ha Ha Ha application for the iPhone. You know and I know that she’s been Jokerized, but when she sees the picture, she claims that she’s Batman in it. And who’s going to argue that point with a four year-old. The next was just blogged by Kiel Phegley and reblogged by the Comics Reporter, and the third and fourth are something I found and saved back in April: Andy Warhol dressed as Robin, the Boy Wonder. Enjoy. EDIT: This seemed thematically appropriate, so I’m adding it on: the last image is Ms. Macdonald of Stately Beat Manor dressed up in the clan emblem.